Upcycle. It’s my favorite new word and such a positive twist on recycling. Instead of recycling or (or “downcycling”) which recreates something of lesser value, upcycling turns disposables into something of higher value. According to a recent article in Entrepreneur Magazine, the upcycling trend is especially popular among the online artist marketplaces. In fact, the number of products on Etsy tagged with the word “upcycled” rocketed up from about 7,900 in January 2010 to nearly 30,000 a year later–an increase of 275 percent. The opportunities for upcycling are alive in the gardening world, too. 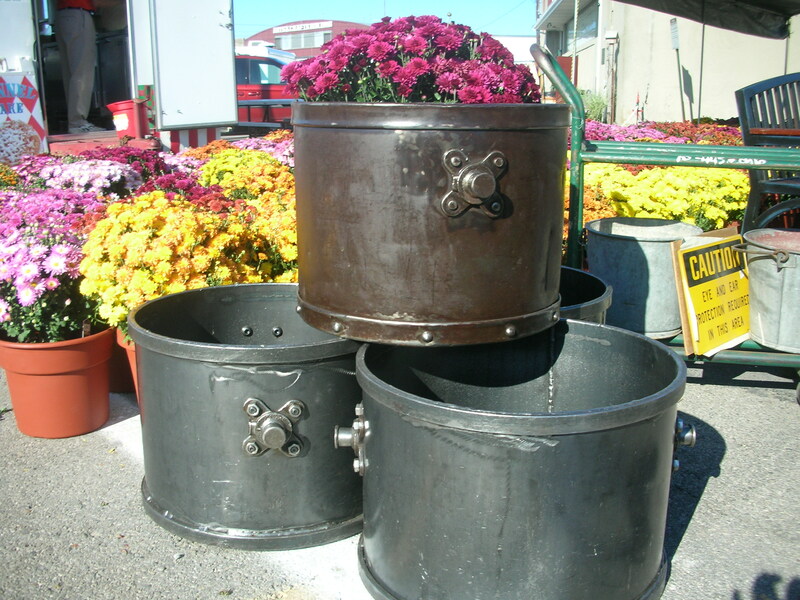 Just check out these upcycled containers – a handbag and baby shoes at deMonye’s Greenhouse and industrial containers at the Springfield Flea Market Extravaganza. 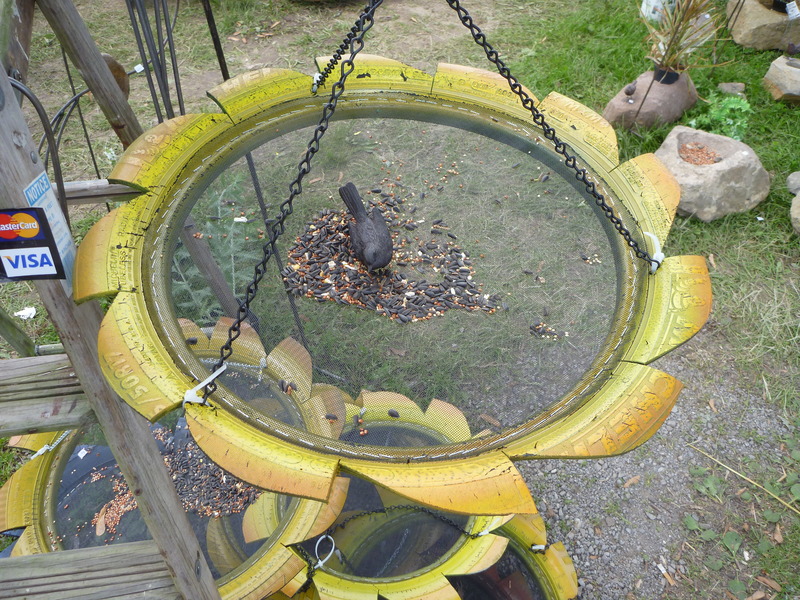 I also love this bird feeder from a used tire. Inspired, I’m now on the prowl for things to upcycle. Rather than buying new trellises and garden art, I’m scouring flea markets, garage sales and even our basement for treasures to upcycle . Isn’t it great that it’s fashionable to be thrifty? Let us know what you’ve upcycled. 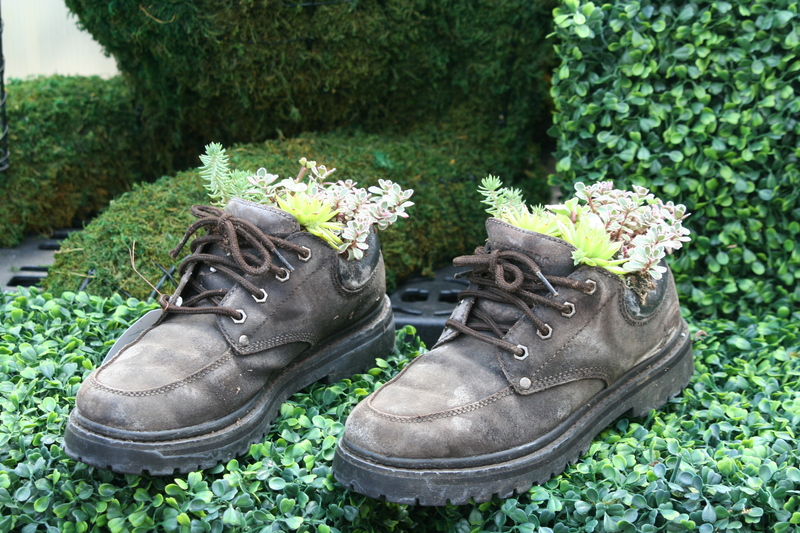 The volunteers at Chadwick Arboretum are getting into the “upcycling” trend this year. At the Chadwick Plant Sale there will be actual demonstrations of how to plant in odd containers, plus a bunch of them for sale. The oddest planters we’ve collected so far might be the rice sack and the beer keg (small)!